The Oakland Livingston Human Services Agency (OLHSA) is a community action agency that offers a variety of programs to help those in need within Oakland and Livingston counties. One program that OLHSA offers is Head Start, a preschool program for families in need. The goal of Head Start is to promote positive learning experiences, and provide the students with services to help them reach developmental milestones and keep on track with their peers. When it was announced that our school volunteer event would be at the Head Start in Pontiac, I was excited and immediately signed up. We would be responsible for three projects: painting murals, planting miniature gardens and installing privacy fencing. I signed up to help with the gardening project. The volunteer event occurred on June 2. The building had previously been a business building. It had four floors – and had a very beige color scheme. Since the children who participate in the program are all 5 years old and younger, the mural idea was suggested to liven up the walls. Outside, in a fenced off area behind the building, was a small playground that overlooks a pretty bleak area. Head Start used an outside grant to purchase privacy fencing, which they requested we help install. With the outside world fenced off, we would plant three separate gardens to brighten up the playground. After touring the building, we broke off into teams. The painting team was responsible for three murals. They were strategically placed by the entrances to classroom hallways. The themes were under the sea, a forest scene and outer space. The gardening and fencing team headed outdoors to begin our project: a pizza garden, a butterfly garden and a flower garden. The pizza garden would have tomato plants, red pepper plants, basil and other spices. Marigolds and similar flowers would be planted in the butterfly garden, and the flower garden would be a mixture of flowers. We finished the gardening as efficiently as possible to have all hands on deck to install the fencing. While the playground was new, the fence was not. It had been weathered, and while some panels slid in nicely, others fought to go in. If you applied too much pressure on the panel, it would bend, rendering it almost useless. Even though my wrists were bruised, and the process was frustrating, it proved to be worth it. A woman rolled down her window, and yelled, “You are all very nice to do that for them! They need it, and they’re going to love it.” It reminded me that we were doing was valuable to the organization. We all went back inside to see the murals. The under the sea mural was the first on our path. The team not only painted the sea life, but used glitter glue and shimmering cardstock to add more depth. Our next stop was the second floor, where the forest mural was drying. A huge mountain was the background to a pine tree, bears and squirrels. Our last stop was the third floor to see the outer space themed mural. 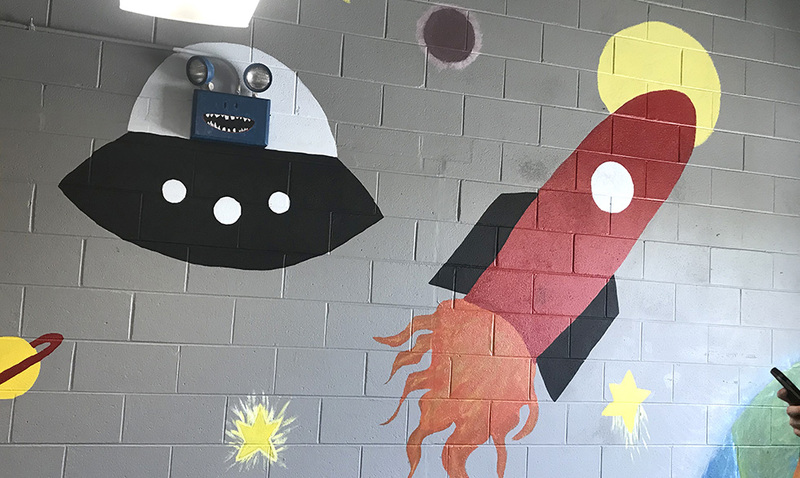 Besides the added details of stars and the rocket ship, the team also turned the fuse box on the wall into an alien spaceship. The coordinator gushed that the students would be so excited to see the new color on their walls. I went back to the Head Start to get video footage of the students seeing the murals and gardens for the first time. We first went to the second floor, where a small group of 4-year-olds were “petting” the bear. The outer space and under the sear murals had the same reactions. Students were running off the elevator to touch the walls. At recess, the kids walked to each garden, which was immediately sniffed and inquired about. Eventually, they decided they’d heard enough about the garden and ran off to play. While I was there, a few would run back, squat down and look over the garden again, touching the signs and smelling the plants. Overall, the students loved the new additions to their school. Seeing them interact with the murals and gardens was a wonderful sight. Hopefully, we’ve inspired future artists and botanists!